Artichoke dip is, by definition, awesome. Ours is not only hot, melty and creamy, but it also boasts a crust of savory Parmesan. You win! Combine coating mix and seasonings in medium bowl; stir in shredded cheese and Parmesan cheese. Reserve 1/2 cup shredded cheese mixture; mix remaining with cream cheese, mayo and artichokes. Spoon into shallow 1-qt. baking dish or 9-inch pie plate; top with reserved cheese mixture. You'll know it's a special occasion when you get to enjoy a serving of this delicious dip. 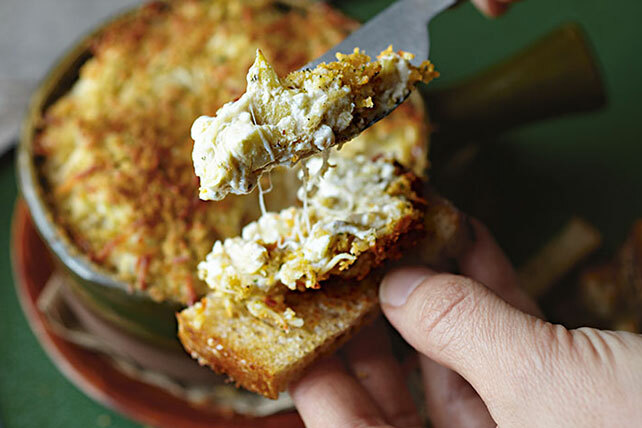 We really love this recipe which was originally developed using our recently discontinued FRESH TAKE Cheese Bread Crumb Mix. We revised it to use KRAFT Shredded Cheese, SHAKE 'N BAKE Coating Mix and seasonings. Our Kraft Kitchens team has developed substitutions for the entire FRESH TAKE lineup so that you can continue to enjoy the great taste of these products. Click here for our Italian Parmesan substitution guide. Give it a try! Serve with toasted bread strips.